You would really have to try hard not to have fun when visiting Montreal. The city beams with culture, architecture, world-class restaurants, a vibrant nightlife, great shopping and people truly passionate about music. It’s no surprise then that Montreal has served as a home to an audio show for many years. 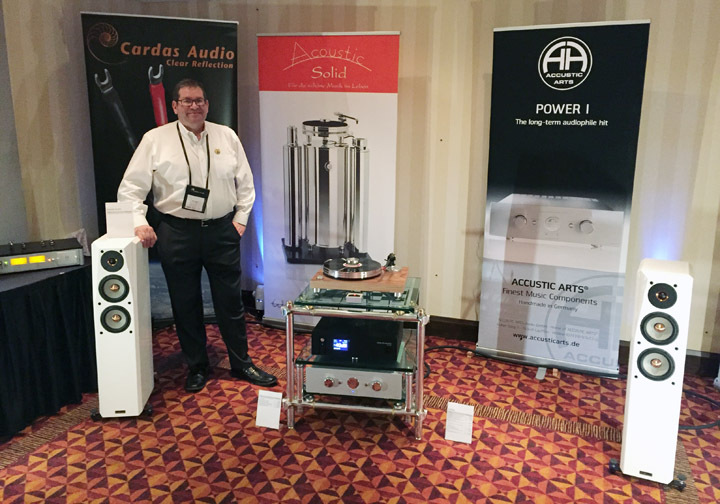 This spring, George de Sa and I (Suave Kajko) travelled to Montreal and explored just about every corner of the Montreal Audio Fest. In our business, sometimes the lines get pretty blurry between work and fun. This was definitely one of those times. Below you will find highlights about the most interesting exhibitors I came across on the show floor. George’s report will follow in the next few days. As you come down the escalators toward the large meeting rooms at the Hotel Bonaventure, one of the first rooms you see is the Totem room. This room is always one of the best “dressed” rooms at the show and this year was no different. Outfitted with beautiful graphic panels and comfortable seating, the setup offered a laidback lifestyle environment. 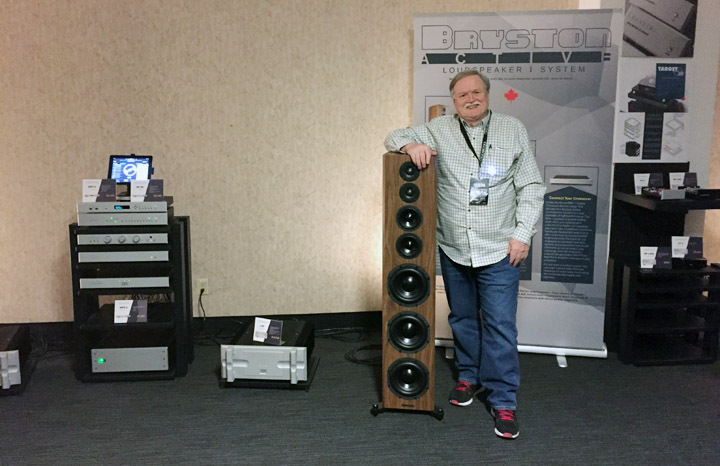 Inside the room, attendees had a chance to meet industry legend and founder/designed of Totem speakers Vince Bruzzese (pictured above), who ran demonstration sessions throughout the weekend. Lucy Lentini, the VP of Sales & Marketing and the mastermind behind Totem’s brilliant marketing (pictured above) was also happy to chat with visitors. 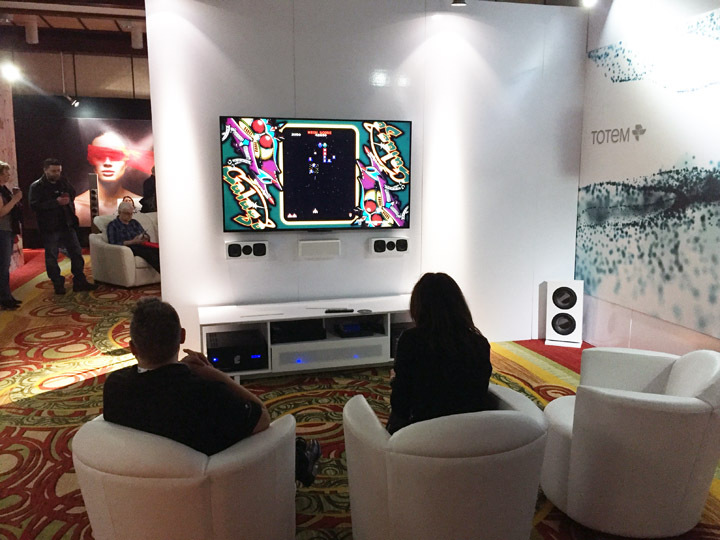 On one side of the room, Totem presented attendees a chance to listen to its Totem Tribe Tower speakers ($5,500). 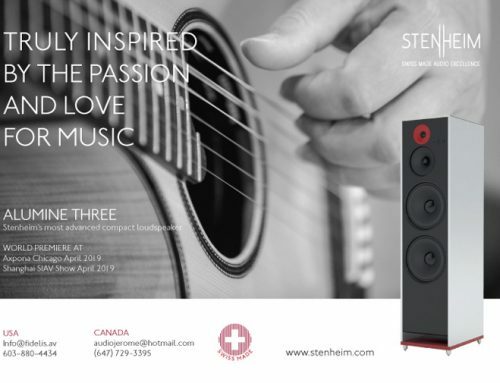 I had originally listened to these speakers at the TAVES Consumer Electronics Show in 2017 and immediately fell in love with the sound. Vince played a number of different music genres for me to demonstrate the speakers. 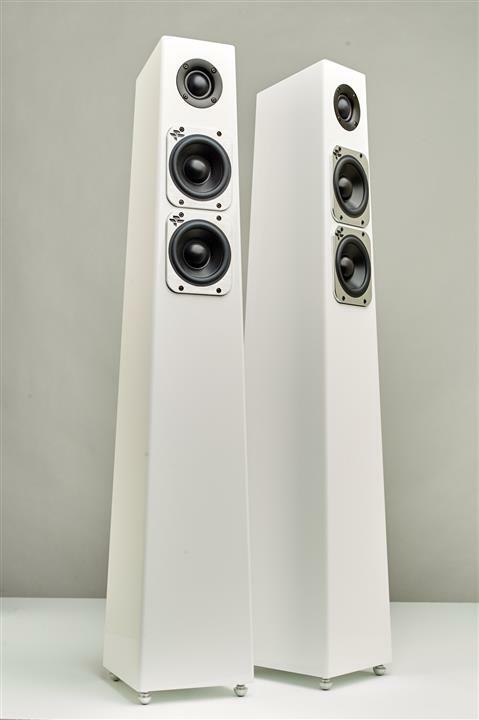 The Tribe Towers are pretty compact speakers but the amount of musical energy they deliver is remarkable, and might leave you looking around for a subwoofer elsewhere in the room. The room was full of people (and conversations) which made it difficult to truly judge their performance. However, I was very impressed with what I was hearing: a clean midrange, fantastic vocal reproduction and a great tonal balance. I hope to be able to try out the Tribe Tower in my own listening room sometime this year. Aren’t these speakers just gorgeous? The other side of the large room offered a 7.2-channel audio system, anchored by a TV on the wall. All seven of the speakers were the KIN Mini Flex ($400 each), mounted on the walls. Providing the low frequencies were a pair of the Tribe subwoofers ($2,000 each). In this setup, attendees were able to try out some PS4 games and enjoy multi-channel Blu-ray concerts. I managed to catch a spectacularly good Blu-ray (I wish I had noted its title) that showed off the system very well. The sound was clean, dynamic and powerful, with the bass frequencies reaching great depths – it certainly left a lasting impression on me. If you’re looking for sleek, low profile speakers to install on the wall, the KIN Mini Flex should definitely be on your short list. Inside this room, I was greeted by Sheldon Ginn, VP of Sales and Marketing at Kevro, who demonstrated the super new Monitor Audio Studio speakers ($1,799). 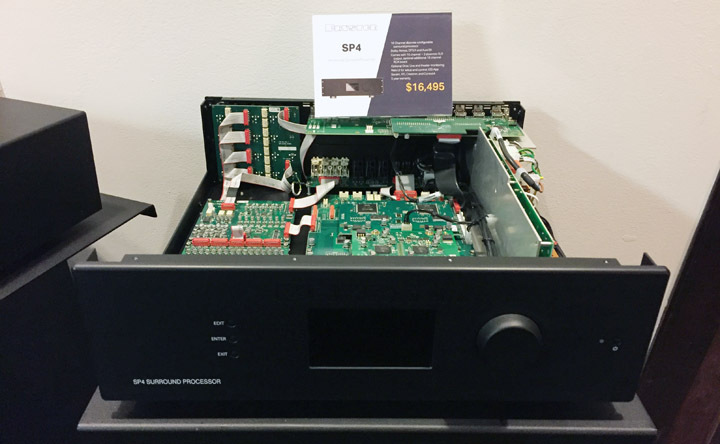 The electronics stack here included all Roksan components: the K3 integrated amp, K3 amplifier and K3 CD player ($2,500 each). The analog source was a Roksan Radius 7 turntable, while digital tunes were fed via a laptop computer. Power was provided via a Torus power conditioner and cabling was from Nordost. Sheldon is very excited about the new Monitor Audio Studio speakers because of the amount of technology they offer for their reasonable price. The Studio speakers employ the same tweeter as Monitor Audio’s reference Platinum series, and the woofers are also based on the same technology as the reference series. 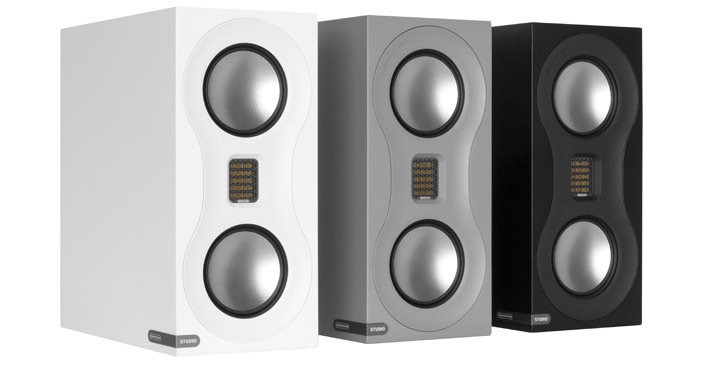 These elegant speakers come available in flat white, gray and black finishes. A listening session here quickly revealed the strengths of these speakers: a warm, melodic midrange, remarkably crisp and detailed highs and a respectable low frequency range. It’s pretty amazing what $1,800 can get you in hi-fi these days. We’ll be reviewing these puppies for NOVO in the next few weeks, so stay tuned for more details about their performance. 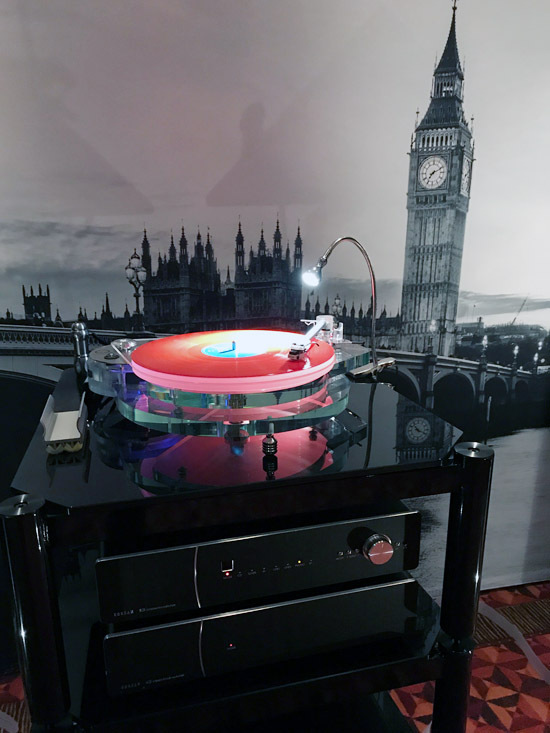 Here’s a cool shot of the Roksan Radius 7 turntable with the famous Big Ben in London, in the backdrop. Aside from being able to listen to a wide range of audio systems, audio shows present the opportunity to meet some of the people that bring these products to life. 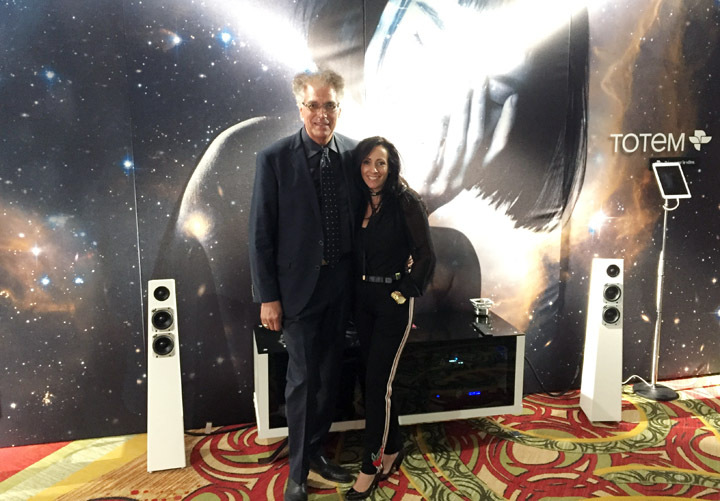 Inside this room, I sat beside James Tanner, VP of Sales and Marketing, who was happy to play me a great selection of music to demonstrate the new Bryston Active Loudspeaker System. In the system, the Model T loudspeakers were powered by Bryston’s brand new 21B Cubed 3-channel amps (70 watts were directed to the bass drivers, 40 watts to the mid-range woofers and 40 watts to the tweeters). 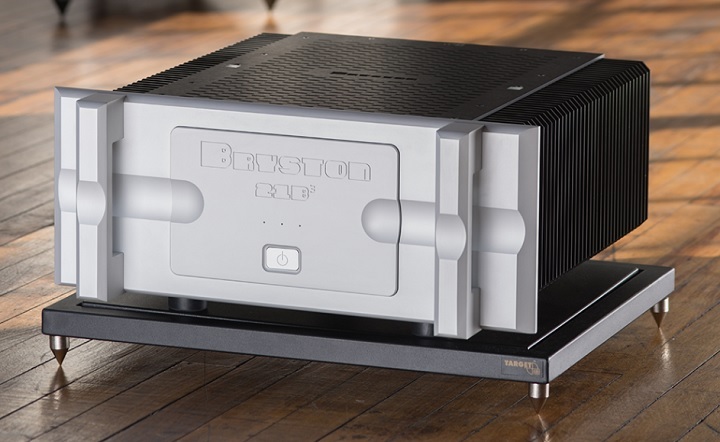 The electronics stack consisted of all Bryston gear, including the BDP-3 digital player, BDA-3 DAC, BP-26 preamp, BAX-1 active crossover and the MPS-2 power supply for the preamp. What’s the advantage of an active system? The crossover is placed between the preamp and power amp, rather than inside the speaker (like in all passive speakers). The sonic advantages of such a design are significant. During the session here, James played me selections ranging from the Crash Test Dummies to Leonard Cohen and Lou Reed. The system offered a massively large sonic landscape with a three dimensional soundstage, a warm, natural midrange and a near perfect tonal balance. The dynamic range of this system was also incredible, as was the handling of bass notes. I could have sat here for hours, just hanging out with James and listening to music. 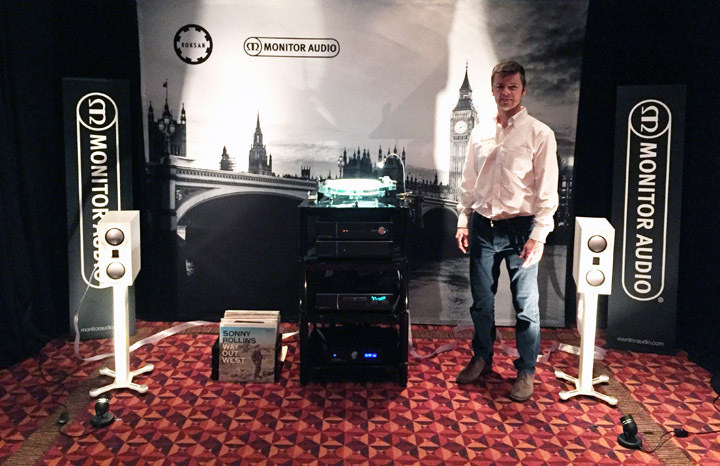 This was definitely among the best sounding systems at the show. 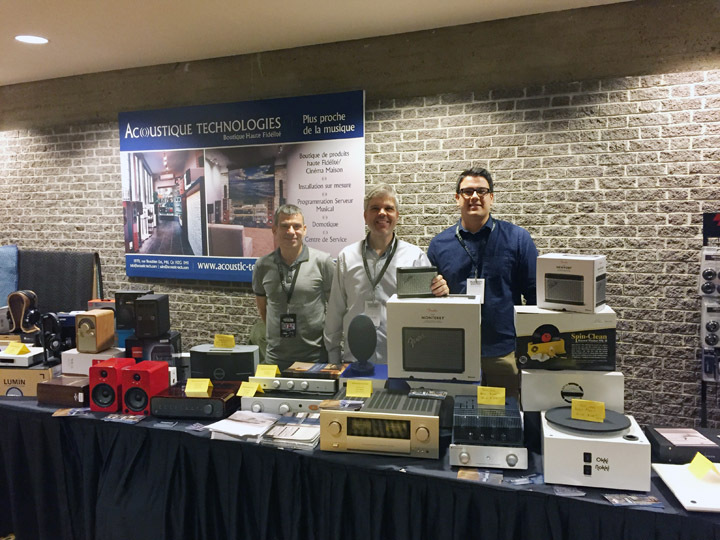 Montreal-based boutique retailer Acoustique Technologies presented a wide spread of products they offer at their retail location and were happy to sell you some of their smaller items and accessories on the show floor. This booth offered just about every hifi product category you can imagine, including speakers, electronics, headphones, portable amps and DACs, wireless speakers, record cleaners and all sorts of neat accessories. 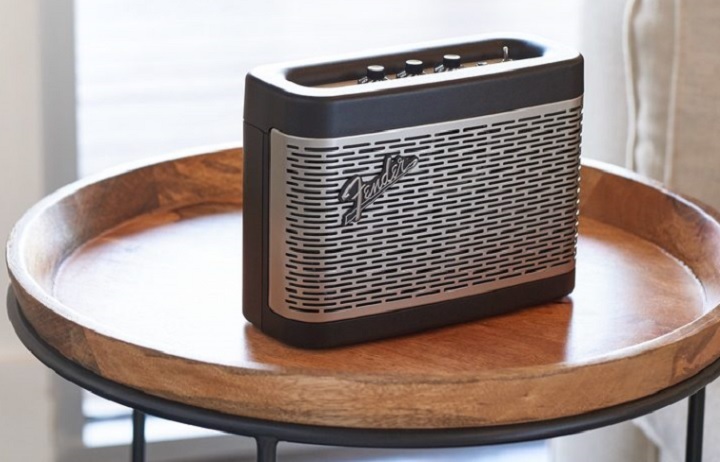 Joe De Melo, President of Acoustique Technologies, was particularly excited to show me the Fender Bluetooth speakers (the Monterey and the Newport models) because he thought they deliver an excellent sound. Styled after classic Fender guitar amps, they have an equally cool appearance. Joe also runs a company called Solid Rack, which manufactures beautiful and very solidly build audio racks/stand. All their products are made in Canada. A Solid Rack product has been serving as the support for one of my systems for the last several years and I’m still very pleased with it. Also inside the booth, Acoustique Technologies showed a full range of cables from a new Quebec-based Cyra Cables. 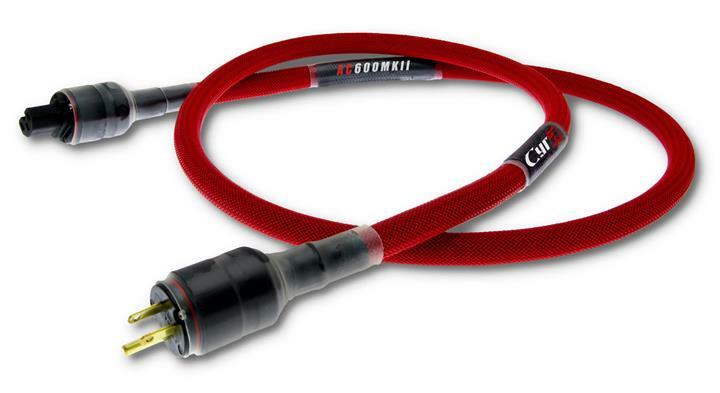 Their products include power cables, speaker cables, RCA interconnects and digital cables. If you live in the Montreal area, Acoustique Technologies is definitely one store you should explore. Joe and his team are a great group of guys. Tricell Enterprises is a Canadian distributor of a large number of amazing brands from around the world. Inside this room, I found another friendly face: Jeff Joseph of Joseph Audio who was happy to play the system for me. 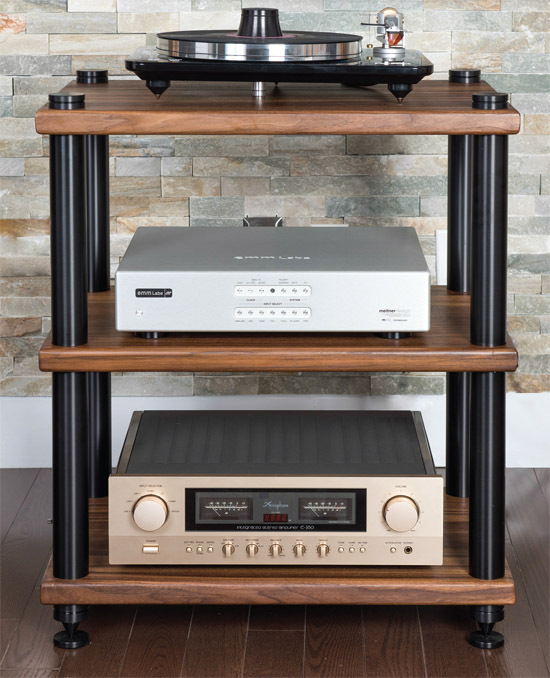 The system here was anchored by Joseph Audio Perspective speakers ($15,825), the Gold Note IS-1000 integrated amp & streamer ($6,500; in this system used a preamp and streamer) and the Accustic Arts Power 1 mk4 integrated amp ($16,500). The audio stack was topped with an Acoustic Solid Wood MPX Midi Xtended turntable, with a WTB370 tonearm and Dynavector 10×5 cartridge. I’ve listened to a few Joseph Audio speakers in the past, at audio shows and retail shops, and have always really enjoyed them. However, I have to admit that the performance of these speakers kind of blew me away. Of course, to be fair, it was the sound of the whole system, not just the speakers. Jeff played some really great recordings for me to demonstrate the system’s strengths. The midrange was rich, musical and highly detailed. As a result, both vocals and instruments like the piano sounded remarkably realistic. A black background and an outstanding soundstage was another highlight of this system, the sound was near holographic in its nature. Instruments were placed far off to the sides and deep within the soundstage, while vocals were laser focused in the center. The highs played fast, sounded crisp and superbly detailed. Recordings that offered good bass line were played with a great extension and solid definition. In many ways, this was one of my favorite sounding rooms at the show. In fact, there was a reel to reel tape player at the side of the room which also sounded fantastic and super clean, but I was so engaged by the music, I completely forgot to snap a picture of it.